Kay Starr and Bunny Lewbel. Several factors influenced NBC's decision in 1951 to expand the number of Four Star Revue hosts. First, some of the stars were having trouble producing the expected ratings. Second, with more and more money flowing into television, the competition from other networks was becoming fierce. Third, NBC had found with The Colgate Comedy Hour that scheduling conflicts, illnesses, and the simple fact that some of its stars simply weren't well-suited to the revue format, meant that it was important to have a backup plan. To hedge its bets, the network brought in additional hosts who could be called upon to fill in for or replace the regulars, if needed. Holding on to its original four stars, Revue, in its second season, added the likes of Olsen and Johnson and Martha Raye in four episodes each, Spike Jones in two, and Victor Borge, Bob Hope, the Ritz Brothers, and Paul Winchell and Jerry Mahoney each doing one apiece. With a larger stable of hosts, the old Four Star name was no longer accurate, so the show was rechristened All Star Revue. Ole Olsen and Chic Johnson were best known for the Broadway show Hellzapoppin and the subsequent movie of the same name. It was pure vaudeville, but of a very bizarre kind. The comedy duo had tried TV once before, in a 1949 summer replacement series called Fireball Fun-For-All. This time around, the format was much the same, including cast members June Johnson and Marty May (Chic Johnson's daughter and son-in-law, respectively) and J. C. Olsen (Ole Olsen's son). As described in The Complete Directory to Prime Time Network and Cable TV Shows by Tim Brooks and Earle Marsh (Ballantine Books), "Gimmick props, midgets running frantically across the stage, leggy showgirls, seltzer water, and custard pies were all the stock-in-trade of this noisy and unpredictable revue, which generally resembled organized mayhem." Despite the zaniness (or perhaps because of it) the team didn't go over well with viewers and weren't re-signed for the following season. Comic actress and singer Martha Raye had had a successful career on Broadway and in films (including Olsen and Johnson's Hellzappopin) before coming to All Star Revue. Her style of mugging and buffoonery was a perfect fit for television. "Miss Raye is an uninhibited comedienne who can be genuinely funny," noted Variety. "It's low comedy of a high order...With her around, dullness takes quick flight and screwball situations get the play." Raye was so successful, in fact - with both critics and viewers - that she not only returned in subsequent seasons but eventually took over the entire show. Nat Hiken, who had so ably assisted Jack Carson, was now working for Raye and figured out how to meld her natural talent for clowning with smart writing to make for first rate comedy. Meanwhile, Carson jumped ship after his February 16th installment to star in the Broadway revival of Of Thee I Sing. The absence was intended to be temporary, but he never returned (though he did host a few Colgate Variety Hours in 1955). Despite the improved ratings, holding on to sponsors didn't get any easier. With an increase in cost to $60,000 per episode, Motorola and Norge dropped out. NBC managed to hold on to Pet Milk and convinced Kellogg's cereals and Snow Crop orange juice to sign on. But the latter cut out after the May 31st telecast and was replaced the following week by Hazel Bishop cosmetics. While starting the season at the Center Theatre in New York City, construction of the transcontinental cable line allowed the show to move to the west coast in November. It was a boon to hosts like Ed Wynn, Jimmy Durante, and Danny Thomas, who were based in Hollywood, but Jack Carson and Martha Raye continued to originate their shows from New York. Note: Ezio, newly signed by NBC to an exclusive five-year radio-TV contract, was starring in South Pacific on Broadway. (15 days later, he hosted The Colgate Comedy Hour.) Here, he sings "Some Enchanted Evening" from that show and follows it with "Non Più Andrai" from The Marriage of Figaro, "You Belong To Me," and "I'll See You In My Dreams." Jane sings "With a Song In My Heart" and "Blue Moon." Ben Blue, Variety opined, "came through with the program's top comedy moments." Jimmy Durante and Jack Carson both appear on film, the former from Canada and the latter from London. Danny Thomas was announced but didn't appear. Note: Variety felt the comedy team wasn't up to par in its All Star Revue debut. "O&J's first video attempt in several years didn't hold up...They have proved that there is entertainment in their offerings, but they didn't show the choice items." Note: Ed and Joan do a hospital sketch. Anne sings "Come On-A My House" and "Hello Young Lovers." Note: While in the previous season, Jack had used a storyline to tie all the acts together, Variety noted that here he was tending more toward a traditional variety format. Note: Jimmy and Helen do a medley of "Our Voices Were Meant for Each Other," material from Rigoletto and Carmen, "Put On Your Old Grey Bonnet," and "Waiting for the Robert E. Lee." In the Club Durant sequence, Jimmy and Eddie do "She's Nobody's Sweetheart Now." This episode was one of All Star Revue's more successful outings, scoring a Trendex rating of 39.0 and ranking sixth for the week. Note: Danny does his celebrated "Ode to a Wailing Syrian" routine that Variety called "a terrific winner." Kay sings "The One I Love" and "Don't Tell Him What Happened To Me" and duets with Danny on "Take Me Back to Tulsa." Note: In her TV hosting debut, Martha scores big, doing comedy (a blind date with Ezio) and music (singing "Mr. Paganini" and "That Old Black Magic"). "With Miss Raye's raucous buffoonery contrasting neatly with Pinza's suave charm," wrote Variety, "the two socked across a full hour's entertainment, making this one particular program, at least, a hot contender for the rating honors which the series has missed so far." Note: Victor spoofs both Ed Sullivan ("Ed Silverman") and European TV shows. Lauritz sings "The Prize Song" ("Morgenlich leuchtend") from Wagner's Die Meistersinger. Variety called Borge "an excellent satirist both musically and otherwise." This was Jack Carson's slot, but he was busy doing a fill-in on the The Colgate Comedy Hour on October 21. Note: Owing to the principal guest's celebrity, this show received a better-than-average level of attention in the press. Acknowledging that Durante had "a way with the women," Variety noted, "They seem to bloom under his guidance and there's something about the Schnoz that makes otherwise reasonable women become expert comediennes." As the President's daughter, Margaret Truman had to come across as dignified but relaxed, and with Jimmy's help, managed to achieve both. On the Durante spoof "Margaret, the Well Dressed Gal," she does a "mild strutaway" that the trade paper called "boffola." Note: Dorothy sings "Moon of Manakoora" and "I Can't Give You Anything But Love." She and Ed do a Samson and Delilah parody, at the end of which Bob Hope walks on to remark, "Pardon me. I thought this was The Road to Morocco." According to Variety, this was Dorothy Lamour's TV debut. Leo Solomon takes over as Wynn's director, and Harold Kemp joins the show as executive producer (sharing the title with Pete Barnum). This was Ed Wynn's first All Star Revue show to originate from the west coast. Note: For this episode, instead of originating from the Center Theatre at Rockefeller Center in New York City, Carson conducted an experiment by moving his show to Studio 8-H at NBC's Radio City facility. The goal was to be able to move fluidly from set to set, which was more difficult in a theater setting. The theme of the show is a jewelry store heist, with the characters moving through a series of locations chasing after the thief. Note: According to The New York Times, this was Ethel Barrymore's TV debut. Like Helen Traubel and Margaret Truman before her, Ethel is a delightful foil for Jimmy's antics. "It was her unpredicted banter with the Schnoz," declared Variety, "in which she displayed a master's know-how of timing her comedy lines, plus her piano'ing while he sang 'There's a Place in the Theatre for You,' which really wowed. Whatever it is that brings out the best in these guestars, Durante's got it and certainly knows what to do with it." As The New York Times noted, "Everyone in the audience must have wanted to do just what Jimmy did; put his arms around one of the theatre's great ladies." This was Jimmy's first show from the west coast. Note: Billie plays a shopper in a department store during the Christmas rush, and The Modernaires sing "Juke Box Saturday Night." Danny performs a dialect bit with a telephone. Lew Parker and Virginia Grey do a sketch in character as The Bickersons, a popular feature on both radio and TV. Note: In a dream sequence, Martha imagines that she's Cinderella to Bob's Prince. Variety enthusastically endorsed this effort, noting that Martha "was able to carry the major portion of comedy in an authoritative manner and worked the medium as though it belonged to her." She was even compared to Milton Berle and Jerry Lewis. Note: Variety felt this outing was below par. "The usual Durantesque flavor was missing, but it's evident to viewers that a fair Durante divertissement is worthy entertainment." Note: Olsen and Johnson do sketches about Louis XVI and Marie Antoinette, westerns, and Shakespeare plays. According to Variety, "This duo's low comedy antics could probably be compressed into an okay 15-minute stanza, but stretched over 60 minutes, it becomes more than a bit tedious." Note: This was Jack Carson's last All Star Revue. Several months later, on August 1, 1952 to be exact, he married his co-star Lola Albright. Note: Gloria provides commentary on her silent movies and does a love scene with Jimmy. "La Swanson helped tremendously by falling into the spirit of the stanza," said Variety. Note: Olsen and Johnson play private detectives Martin and Kane (a takeoff on the detective show Martin Kane, Private Eye) and June Johnson (Chic's daughter) is seen as a verbose cab driver. Variety was disappointed in the effort believing that, "Olsen and Johnson missed the boat principally due to poor material." Art Linkletter appears in a filmed Kellogg's commercial. This show originated from New York. Note: Jimmy sings his own songs "The Durante Flip" and "One in a Million." Edward Arnold presents Ed's grandsons Ned and Tracy with a plaque for Ed from Actors Equity commemorating the comedian's 50 years in show business. As Ed retires to his bed, Jimmy and the cast surprise him with a 50th anniversary cake. Note: Margaret Truman returns, following a successful previous appearance with Jimmy. In a quiz show spoof (with Jimmy as the quizmaster), a blindfolded Margaret is instructed to add some marks to a blackboard. When the blindfold is removed, it's revealed that the blackboard spells out "I Like Ike." "I'll never be able to go home now," Margaret ad libs. In another bit, Margaret takes part in a "Truman, Jackson & Durante" act. Note: Perhaps to counter the idea of the President's daughter appearing with Jimmy Durante, Martha has the daughter of British Prime Minister Winston Churchill as her guest. In one sketch, the upper class Sarah studies Martha's mannerisms in order to learn how to play the role of Adelaide in Guys and Dolls. "Miss Churchill fell into the groove handily," noted Variety. Note: Ed demonstrates the various Easter hats he's designed and visits Dinah on the set of a roaring twenties movie she's shooting. When Ed switches on a giant fake TV set and nothing happens, he ad libs, "Something's wrong. But this is an hour show; we've got time." Dinah sings "Life Is a Beautiful Thing" and "I May Be Wrong," and in a reprise of her TV debut on Ed's show in 1949, she croons "Tea For Two" perched atop the old pianocycle. Anthony, Allyn and Hodges do a spoof of ballroom dancing. In honor of his 50th anniversary in show business, Ed is presented with an award from the Lamb's Club by Pat O'Brien. As noted by Variety, "He's been entertaining in virtually every media from live to film to electronic and has been an important personality no matter where he worked." Note: A sketch about married couples, featuring the Masons as one couple and Danny and Betty as the other "wound up in a shambles of confusion and failure to excite laughs," declared Variety. Note: It seemed like a natural pairing. But in her television debut, Bette Davis proves herself, in the words of Jack Gould of The New York Times, "not too serious a rival to Lucille Ball...Miss Davis seemed excessively reluctant to enter into the spirit of the Durante highjinks and played her role too ceremoniously. The flair for high comedy was there, but Miss Davis seemed to be holding back. Such halfway measures do not work out well with Mr. D."
Note: As part of the act, Fred, in his television debut, is nervous at first, but Bob helps him feel at home. The pairing of Hope and MacMurray turns out to be good for a few hearty laughs. Gale sings "Whose Little Boy Are You?" while Alfred warbles "Beyond the Reef." The Bell Sisters do their hit "Wheel of Fortune," and Bob joins them for a comic uptempo rendition of "June Night." Dancer Matty King was supposed to perform, but the show ran over and his number was cut. This episode, played to a military audience, originated from the Presidio in San Francisco. Note: Reprising a "silent movie" sketch she performed previously on Ed's CBS show, Lucy plays a Mata Hari-type spy trying to use her feminine wiles to wring a state secret from Ed. Variety called it "socko" and "a topdrawer item." The Duncan Sisters sing "Side By Side," "Double Dee Do," and "Smiles." The Whippoorwills do "Ballin' the Jack." Note: In one sketch, Danny plays a husband whose wife, June, is a little too enamored of movie stars. In another, June plays the first woman president in 1973, with Eleanor as her vice president. Danny sings "America, I Love You," "Take It Easy, Be Casual, Relax" and (to Bunny) "Daddy's Little Girl." Note: The Ritz Brothers, in their television debut, substitute for Jimmy Durante, who was in London for an engagement at the Palladium. 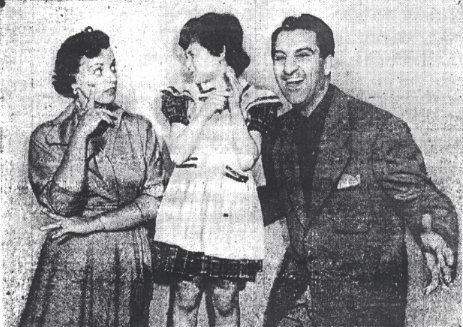 Critics liked the Dragnet spoof - performed entirely in pantomime with narration by Jack Webb himself. The New York Times's Jack Gould felt the three Ritzes - Harry, Al, and Jimmy - "rather handily walked off with late season honors in video comedy." Note: Martha inherits a fortune - along with a butler in the person of Arthur Treacher. Variety was disappointed in this opus: "Even Miss Raye's exuberance couldn't save the hour from almost total bankruptcy." Note: Spike and the City Slickers give their usual zany treatment to "Chloe," "Holiday For Strings," "All I Want For Christmas Is My Two Front Teeth," and "Poet and Peasant Overture." Helen sings "Kiss of Fire," and Liberace performs "Ritual Fire Dance" and "September Song." Note: Dummy Jerry dances and plays drums with Hot Lips. Variety liked this show, calling it "one of the best of the series."